Dhruv Ghanekar dons many hats. The most interesting of which is that of a music sojourner. The Mumbai-based musician, music director and songwriter has constantly driven himself and his genre-bending music to the limits and beyond in seasoned proficiency both in the studio and on stage. Giving his songs a listen can easily convince you why the multi-instrumental artiste endeavours to keep moving across the music soundmark to conquer new highs in his song offerings. Making music since he was nine, Dhruv has a career spanning across ad films and alternative movies with over 3,000 projects in his kitty. The feather in his cap as an accomplished artiste is the range of collaborations he dabbles in, be it in his albums or in his repertoire of music projects. Following his debut album Distance in which he invites listeners to traverse space and time, Dhruv traverses space and time in Voyage where he himself goes on a journey, both literally and musically, across the soundscape of India. Voyage is global and Indian at the same time as it seamlessly blends North and West Africa, jazz, pop, Assamese folk and Rajasthani folk and classic rock into a singular sonic voice in the nine-track compilation. Featuring award-winning international artistes like New York-based Raul Midon, French/ Cameroonian bassist Etienne Ma Bappe, Algerian drummer Karim Ziad, Mauritian bassist Linley Marthe and percussionist Trilok Gurtu. Rajasthani folk singer Ila Arun, Kartik Das Baul from West Bengal, and singer-songwriter Vasuda Sharma give the album its eastern touch. Launching into a cacophony of people noises, ‘Zawi D’ kicks off in a very colloquial feel. Rhythmic intros, synthesized vocals and a classical touch of keyboard patches backed by saxophone sonnets leads to a triumphant blend of Eastern and Western chops. Dhruv really opens up in ‘Baare Baare’ in emphatic vocal tenacity accompanied by Kalpana Patowary on vocals. The improvised, consistently patterned rhythms continues from where it left in ‘Zawi D’ accompanied by explosive percussive chops and a spectacular bridge. Meandering to a waltzy calm serenade, vocalist Vasuda Sharma joins the bandwagon with Dhruv and they create a magical ballad of pop sonic bliss. The whispering singer’s ethereal voice and the enigmatic cello floating in the background over clapped beats builds to an exhilarating climax in the dual-lingual ‘Sway With Me’. ‘Dhima’ will catch you totally off guard with a very typical South Indian beat blazed by some thrilling processed guitar work. Ila Arun sings away calling out “Dhima Dhima” in this mind-blowing fusion of western instruments in a very exuberant Indian song that exudes dance frenzy. Foot-tapping keys, acoustic guitar soundscapes and vibrant drums lead the way in ‘Chilli’ which is more tangy than spicy. It’s the kind of street vibe song you will hear off the radio on a sunny evening by the coast. What makes the song stand apart is the virtuosic violin lead by Ginny Noel Luke that rampages in and holds you captive till the final screeching bow stroke. Male enigmatic vocals dominate the title track with Raul Midon, Etienne Mbappe and Trilok Gurtu voicing their tonal proficiency backed by a full-fledged orchestral set-up with guitars, cig fiddle, percussions, keys, bass, drums and piano in the loop for the song. A very melancholic turn happens in ‘This India’, that soon establishes a solemn violin and viola instrumental-backed sonic lament. The sarang blends in harmoniously in the skillfully composed offering. Water ripples in the Voyage in ‘The Boatman’s Song’ as singer Katik Das Baul calls out in typical riverman fashion as the track effortlessly sways you to the tug of the aqua vibe. The triumphant Voyage ends on a perfect tribute to a journey across the country with ‘Anthem’, a solo rendition of the National Anthem by Dhruv bringing curtains down on a sonic expedition of epic proportions. 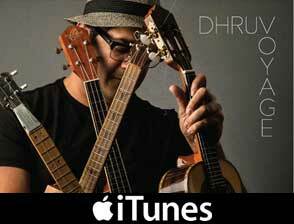 It's been a few years since Berklee-trained guitarist/composer Dhruv Ghanekar last crossed AAJ's radar. That was at the Borneo Jazz Festival 2011, where his quartet powered through a jazz-fusion set of the highest order. For his second recording as leader the Mumbai guitarist—who has performed with sarangi maestro Sultan Khan, Zakir Hussain and Scott Kinsey—shows off his hefty compositional strengths. With Etienne Mbappe, Trilok Gurtu,Ranjit Barot and Karim Ziad heading an all-star cast, Dhruv explores the nexus of Indian and African music in a fusion that's alternatively as intoxicating as Mumbai bustle and as soothing as a Ganges sunset. Much of the music is filtered through a jazz-fusion prism, no more so than on "Zawi D" where the babble of a market scene and Mbappe's vocorder pay clear tribute toJoe Zawinul/Weather Report. Bassist Linley Marthe and Ziad's propulsive rhythms underpin snaking ensemble and individual lines, with soprano saxophonist Carl Clements and then Dhruv stretching out. A riveting soloist, Druv's vocabulary draws on traditions stemming from John McLaughlin and Indian classical music in a heady, melodious fusion. ThroughoutVoyage Dhruv doubles on keyboards and his six-string chops are released sparingly, according to the music's demands. Indian vocals feature prominently throughout, with varying intensity and tone. On "Baare Baare" Dhruv's smoky tenor and Kalpana Patowary's honey-smooth vocals provide striking though complementary textures. Washing keys and subtle percussive pulses gain in potency as the vocal narrative grows; bursts of electric guitar and baritone saxophone add meat to the bone. The more radio-friendly "Sway with Me" pits Vasuda Sharma's angelic, Indian vocal against Dhruv's English response, which is evocative of Dave Matthews at his most anthemic; cello, violin and viola lend a suave orchestral sub-plot. The stripped down churning rocker "Dhima" foregrounds Ila Aruns' darkly bewitching sung/spoken vocal; Dhruv's grungy riffing gives way to searing runs as the tempo quickens on this feisty gem. The instrumental "Chilli" trots with a lovely, bluegrass gait. Ravi Kynpstra's bass, spoon (?) percussion and Dhruv's banjo-like cigar-box fiddle form the backdrop for Ginny Noel Luke's untethered violin; it's a tremendous tune evocative of Jenny Scheinman's mischievous country-blues. The mostly acoustic title track brings together Barot, Mbappe and Gurtu, though surprisingly, rhythm almost plays second fiddle to vocal melody. Mbappe shares soulful vocal duties with Raul Midon while the extraordinary bassist Sheldon D'Silva—a longstanding Dhruv collaborator—and Barot ply a steady course. A veteran of Indian film and television scores, Dhruv invests cinematic lustre on the lyrical tone poem "Is This India." Dhruv and Neuman Pinto harmonize as Jeetendra Thakur (violin and viola) and Sabir Khan (sarangi) infuse this plaintive, wordlessly sung ballad with their orchestral blues. Khan's sarangi dovetails with Katik Das Baul's stirring Indian vocal on "The Boatman's Song," which weds tradition and ambient textures in atmospheric union. The unaccompanied acoustic guitar lullaby "Anthem" rounds out the set in delicate mode. Instantly gratifying, Voyage combines serious musicianship with commercial appeal. Though its traditional Indian roots are strong, Dhruv's contemporary flair seamlessly navigates other cultures, beautifully blending various folkloric colors with driving rock muscle, jazz-fusion elasticity and vocal sophistication. It's a blast from start to finish.